Relational Calculus – Java, SQL and jOOQ. Relational algebra nicely describes the various operations that we know in SQL as well from a more abstract, formal perspective. One of the most common relational JOIN operations is the “equi-join” or SQL INNER JOIN. The above example “equi-joins” the ACTOR, FILM_ACTOR, and FILM tables from the Sakila database, in order to produce a new relation consisting of all the actors and all their associated films. We’ll be looking only at the first two in this article. As you can see, the semi join relation Employee ⋉ Dept only contains attributes from the Employee relation, not from the Dept relation. “Semi” means that we don’t really join the right hand side, we only check if a join would yield results for any given tuple. As you can see, the anti join relaion Employee ▷ Dept only contains attributes from the Employee relation, not from the Dept relation. “Anti” means that we don’t really join the right hand side, we only check if a join would NOT yield results for any given tuple. jOOQ will make sure that the generated SQL correctly renders an equivalent [ NOT ] EXISTS predicate, regardless of how many JOIN expressions you choose to write. SQL is still a moving target. Many many years after relational algebra has been made usefully accessible to our industry via SQL, however, we still do not have native support for all relational operators. Semi join and anti join are two of them, division is a third. Cloudera Impala has shown how easy this syntax could be in an actual DBMS. We follow suit and added support as well. Dear RDBMS vendors: Please add native SEMI JOIN and ANTI JOIN to your databases. Thank you. How to come to this conclusion? Read on! Many popular bloggers and opinion leaders have missed no chance to bash ORMs for their “obvious” impedance mismatch with the relational world. N+1, inefficient queries, library complexity, leaky abstractions, all sorts of buzzwords have been employed to dismiss ORMs – often containing a lot of truth, albeit without providing a viable alternative. But are these articles really criticising the right thing? Or in other words: The “hierarchical” object world and the “relational” database world model the exact same thing. The only difference is the direction of the arrows that you draw in your diagrams. In the relational model, children point to their parent. In the hierarchical model, parents point to their children. ORMs fill the bridge between the two worlds. They’re the inverters of arrows, if you will. They will make sure that every “relation” in your RDBMS can be materialised as an “aggregation” or “composition” in your “hierarchical” world (this works for objects, XML, JSON, and any other format). They make sure that such materialisation is properly transacted. That changes to individual attributes or to relational (aggregational, compositional) attributes are properly tracked and purged back into the master model, the database – where the model is persisted. Individual ORMs differ in terms of offered features and in how much mapping logic they offer in addition to mapping individual entities to individual types. But all ORMs do one very simple thing. Ultimately, they take rows from your tables and materialise them as objects in your class model and vice-versa. A very nice overview of different ORMs has been compiled on the Vertabelo blog, recently, by the way. The implementation details are omitted (and probably account for half of the criticism). But omitting further details allows for straight-forward 1:1 mapping of individual rows from your database to your Java model, without any surprises. Most ORMs – in the Java ecosystem Hibernate in particular – have managed to implement the above idea very well, hiding away all the technical details of actually doing such a model transfer between the RDBMS and Java. There is absolutely nothing wrong with this mapping approach! The “problems” that many bloggers criticise arise not from the non-existing mismatch between the two model representations (“relational” vs. “hierarchical”). The problems arise from SQL, which is a decent implementation of relational algebra. Relational algebra has been defined in order to be able to query relations and to form new ad-hoc relations as an output of such queries. Depending on the operations and transformations that are applied, the resulting tuples may have absolutely nothing to do with the individual entities involved in a query. In other, ORM-y words: The product of relational algebra, and in particular of SQL has no use, as it can no longer be further processed by the ORM, let alone persisted back into the database. To make things “worse”, SQL today is a large super-set of the features offered by relational algebra. It has gotten much more useful than when it was conceived. SQL / relational algebra is not really appropriate to partially materialise relations into a client / store changes back into the database. Yet, most RDBMS offer only SQL for that job. Back to the author / book example. When you want to load and display an author and their books to a web application’s user, you’d like to simply fetch that author and their books, call simple methods like author.add(book) as well as author.remove(book) and let some magic flush your data back into the storage system. Thinking about the amount of SQL code to be written for such a simple CRUD task makes everyone squeal. Perhaps QUEL might have been a better language for CRUD, but that ship has sailed. And unfortunately, because of SQL being an inappropriate language for this job, you cannot ignore that “magic” but have to know well what happens behind the scenes, e.g. by tweaking Hibernate’s fetching strategies. The author attributes are repeated in every tuple. The client (ORM) has to de-duplicate authors first, before populating the author-book relationship. This can be particularly bad when you have many nested relations that should be fetched at once. The amount of data to be transferred is minimal: Each row is transferred exactly once. The amount of queries that are issued may explode into the well-known N+1 problem. Hibernate in particular knows other types of fetch strategies, although they are essentially a variant / optimisation of one of the above. Why not use SQL MULTISET? A single query can materialise all eager-loaded rows with minimal bandwidth usage. Unfortunately, MULTISET is poorly supported by RDBMS. MULTISET (as well as arrays and other collection types) have been introduced formally into the SQL standard as of SQL:2003, as a part of an initiative to embed OO features into the SQL language. Oracle, for instance, has implemented much of it, much like Informix did, or the lesser-known CUBRID (although using vendor-specific syntax). Other databases like PostgreSQL allow for aggregating nested rows into typed arrays, which works the same way although with a bit more syntactic effort. MULTISET and other ORDBMS SQL features are the perfect compromise, allowing for combining the best of the “relational” model with the best of the “hierarchical” model. Allowing for combining CRUD operations with querying in one go, removing the need for sophisticated ORMs, as the SQL language can be used directly to map all your data from your (relational) database to your (hierarchical) client representation with no friction. Conclusion and call to action! We’re living through exciting times in our industry. The elephant (SQL) in the room is still here, learning new tricks all the time. The relational model has served us well, and has been enriched with hierarchical models in various implementations. Functional programming is gaining traction, complementing object orientation in very useful ways. That awesome combination of techniques is hard to beat – we’ve shown how SQL and functional programming can work with jOOQ. All that’s missing – in our opinion – is better support for MULTISET and other ORDBMS features from RDBMS vendors. Thus, we urge you, PostgreSQL developers: You’re creating one of the most innovative databases out there. Oracle is ahead of you in this area – but their implementation is too strongly tied to PL/SQL, which makes it clumsy. Yet, you’re missing out on one of the most awesome SQL feature sets. The ability to construct nested collections (not just arrays), and to query them efficiently. If you lead the way, other RDBMS will follow. And we can finally stop wasting time talking about the object-relational impedance non-mismatch. There has been a lot of hype about the buzzword “web scale“, and people are going through lengths of reorganising their application architecture to get their systems to “scale”. But what is scaling, and how can we make sure that we can scale? If there was anything like free lunch (there isn’t), we could indefinitely combine scaling up and out. Anyway, today, we’re going to look at some very easy ways to improve things on the performance side. Java 7’s ForkJoinPool as well as Java 8’s parallel Stream help parallelising stuff, which is great when you deploy your Java program onto a multi-core processor machine. The advantage of such parallelism compared to scaling across different machines on your network is the fact that you can almost completely eliminate latency effects, as all cores can access the same memory. Parallelism eats up your cores. This is great for batch processing, but a nightmare for asynchronous servers (such as HTTP). There are good reasons why we’ve used the single-thread servlet model in the past decades. So parallelism only helps when scaling up. Parallelism has no effect on your algorithm’s Big O Notation. If your algorithm is O(n log n), and you let that algorithm run on c cores, you will still have an O(n log n / c) algorithm, as c is an insignificant constant in your algorithm’s complexity. You will save wall-clock time, but not reduce complexity! The best way to improve performance, of course, is by reducing algorithm complexity. The killer is achieve O(1) or quasi-O(1), of course, for instance a HashMap lookup. But that is not always possible, let alone easy. On your development box, the left branch (N -> M -> Heavy operation) is the only branch that you can see in your profiler, because the values for O and P are small in your development sample data. On production, however, the right branch (N -> O -> P -> Easy operation or also N.O.P.E.) is really causing trouble. Your operations team might have figured this out using AppDynamics, or DynaTrace, or some similar software. Without production data, you might quickly jump to conclusions and optimise the “heavy operation”. You ship to production and your fix has no effect. Enough theory. Let’s assume that you have found the right branch to be the issue. It may well be that a very easy operation is blowing up in production, because it is called lots and lots of times (if N, O, and P are large). Please read this article in the context of there being a problem at the leaf node of an inevitable O(N3) algorithm. These optimisations won’t help you scale. They’ll help you save your customer’s day for now, deferring the difficult improvement of the overall algorithm until later! But what happens, if later on, you need to amend your String with optional parts? In the above example, it is probably completely irrelevant if you’re using explicit StringBuilder instances, or if you rely on the Java compiler creating implicit instances for you. But remember, we’re in the N.O.P.E. branch. Every CPU cycle that we’re wasting on something as stupid as GC or allocating a StringBuilder‘s default capacity, we’re wasting N x O x P times. And for crying out loud, if you still have StringBuffer references, do replace them by StringBuilder. You really hardly ever need to synchronize on a string being created. … which also shows why you shouldn’t do any premature optimisation. Compared to the split() version, this is unmaintainable. Challenge: The clever ones among your readers might find even faster algorithms. Regular expressions are useful, but they come at a price. If you’re deep down in a N.O.P.E. branch, you must avoid regular expressions at all costs. Beware of a variety of JDK String methods, that use regular expressions, such as String.replaceAll(), or String.split(). Use a popular library like Apache Commons Lang instead, for your String manipulation. 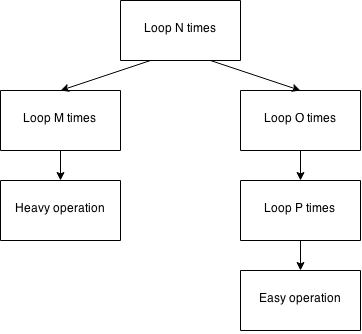 Iterators, Iterable, and the foreach loop are extremely useful from a writeability and readability perspective, as well as from an API design perspective. However, they create a small new instance on the heap for each single iteration. If you run this iteration many many times, you want to make sure to avoid creating this useless instance, and write index-based iterations instead. Some interesting disagreement about parts of the above (in particular replacing Iterator usage by access-by-index) has been discussed on Reddit here. Don’t call expensive methods in an algorithms “leaf nodes”, but cache the call instead, or avoid it if the method contract allows it. When you’re deep down in your N.O.P.E. branch, you should be extremely wary of using wrapper types. Chances are that you will create a lot of pressure on your GC, which has to kick in all the time to clean up your mess. A particularly useful optimisation might be to use some primitive type and create large, one-dimensional arrays of it, and a couple of delimiter variables to indicate where exactly your encoded object is located on the array. An excellent library for primitive collections, which are a bit more sophisticated than your average int is trove4j, which ships with LGPL. The same is true for low values of the other integer primitive types, including char, short, int, long. But only if you’re auto-boxing them, or calling TheType.valueOf(), not when you call the constructor! Of course, you might also want to experiment with off-heap libraries, although they’re more of a strategic decision, not a local optimisation. Modern functional programming languages like Scala encourage the use of recursion, as they offer means of optimising tail-recursing algorithms back into iterative ones. If your language supports such optimisations, you might be fine. But even then, the slightest change of algorithm might produce a branch that prevents your recursion from being tail-recursive. Hopefully the compiler will detect this! Otherwise, you might be wasting a lot of stack frames for something that might have been implemented using only a few local variables. When you’re in the N.O.P.E. branch, you should be wary of maps anyway, because lots and lots of O(1) map access operations are still lots of operations. And the access isn’t free either. But at least, if you cannot do without maps, use entrySet() to iterate them! The Map.Entry instance is there anyway, you only need to access it. Always use entrySet() when you need both keys and values during map iteration. The essence of this implementation is the fact that we have an array of indexed values rather than a hash table. When inserting a new value, all we have to do to look up the map entry is ask the enum for its constant ordinal, which is generated by the Java compiler on each enum type. If this is a global configuration map (i.e. only one instance), the increased access speed will help EnumMap heavily outperform HashMap, which may use a bit less heap memory, but which will have to run hashCode() and equals() on each key. Enum and EnumMap are very close friends. Whenever you use enum-like structures as keys, consider actually making those structures enums and using them as keys in EnumMap. If you cannot use an EnumMap, at least optimise your hashCode() and equals() methods. A good hashCode() method is essential because it will prevent further calls to the much more expensive equals() as it will produce more distinct hash buckets per set of instances. In every class hierarchy, you may have popular and simple objects. Let’s have a look at jOOQ’s org.jooq.Table implementations. … where name is simply the table name. We don’t even consider the schema or any other property of the table, as the table names are usually distinct enough across a database. Also, the name is a string, so it has already a cached hashCode() value inside. // This is a working default implementation. In other words, the whole SQL rendering workflow has to be triggered to calculate the hash code of a common AST element. Note that the latter condition includes argument == null, if you’re using instanceof to check for compatible types. We’ve blogged about this before in 10 Subtle Best Practices when Coding Java. If the argument cannot be equal to this, and if we can check that easily, let’s do so and abort if the check fails. If the check succeeds, we can still proceed with the more expensive implementation from super. Given that most objects in the universe are not equal, we’re going to save a lot of CPU time by shortcutting this method. In the case of jOOQ, most instances are really tables as generated by the jOOQ source code generator, whose equals() implementation is even further optimised. The dozens of other table types (derived tables, table-valued functions, array tables, joined tables, pivot tables, common table expressions, etc.) can keep their “simple” implementation. Last but not least, there is a thing that is not Java-related but applies to any language. Besides, we’re leaving the N.O.P.E. branch as this advice might just help you move from O(N3) to O(n log n), or something like that. In SQL (and we love it, as this is the jOOQ blog) you can declare the outcome you want to get from your database, without making any algorithmic implications whatsoever. The database can then take all the meta data available into consideration (e.g. constraints, keys, indexes, etc.) to figure out the best possible algorithm. jOOQ is at the “bottom of the food chain”, because it’s the (second-)last API that is being called by our customers’ applications before the call leaves the JVM to enter the DBMS. Being at the bottom of the food chain means that every line of code that is executed in jOOQ might be called N x O x P times, so we must optimise eagerly. Your business logic is not deep down in the N.O.P.E. branch. But your own, home-grown infrastructure logic may be (custom SQL frameworks, custom libraries, etc.) Those should be reviewed according to the rules that we’ve seen today. For instance, using Java Mission Control or any other profiler.